The Tampa Bay Lightning got a break Saturday when the San Jose Sharks revealed that they had scratched star defenseman Erik Karlsson despite the fact that he participated in the pre-game skate. Sportsnet’s Elliotte Friedman reported that Karlsson is nursing an injury, but it isn’t expected to be very serious. According to The Athletic’s Kevin Kurz, Karlsson has been struggling with the lower-body injury since the team faced Arizona on Thursday and hasn’t been practicing. He added that Karlsson was limping noticeably after the game against the Coyotes, favoring his left side. While Kurz acknowledged that the injury isn’t serious, the scribe wonders if the Sharks might hold him out until after the All-Star break. San Jose has two games remaining against Florida and Washington on Monday and Tuesday, respectively, and then don’t play again until Feb. 2. The Boston Bruins may have lost Tuukka Rask for some time as the team announced that the goaltender suffered a concussion during Saturday’s game against the New York Rangers and will not return. The hit happened late in the first period when Rangers’ Filip Chytil collided with Rask after scoring a goal. Chytil was actually pushed by Boston’s Charlie McAvoy, sending Chytil airborne and sending Rask backwards, where he appeared to hit his head on the right goalpost. Rask remained on the ice for quite a while before skating off with assistance. Jaroslav Halak took over for Rask. The Athletic’s Scott Powers (subscription required) writes that a league source says the Chicago Blackhawks are attempting to trade Marcus Kruger, Chris Kunitz and Andreas Martinson. While no names are surprises, Powers writes that the team will most likely find a trading partner for Kruger, who has just a seven-team no-trade clause. He is in the final year of a three-year, $9.25MM deal at $2.75MM AAV, which many teams might be willing to take on for some bottom-six help. NHL.com’s Mitchell Clinton writes that Winnipeg Jets defenseman Dustin Byfuglien, who has been out since Dec. 29 with a left leg injury, has resumed skating with the earliest possible return being after the All-Star break. The 6-foot-5, 260-pound blueliner would be an important piece to get back for the Jets, who have missed him in his absence. Today is the final day before the holiday roster freeze comes into effect, though there can still be some movement afterwards. Teams are allowed to recall players during the next two weeks, and can also send down any player recalled after December 11th. That would include anyone called up today, meaning we’ll keep our eye on all the minor moves around the league. 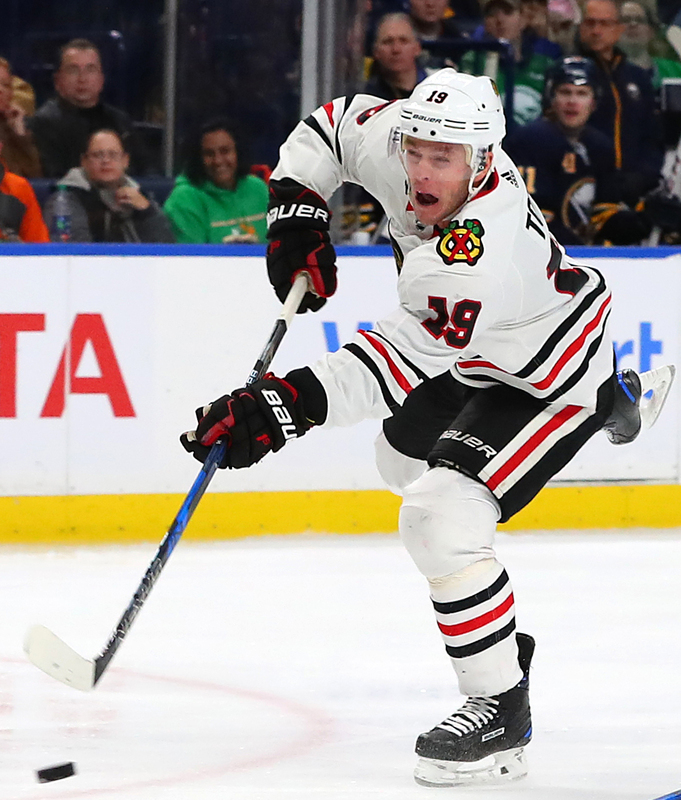 The Chicago Blackhawks have recalled Luke Johnson from the minor leagues while putting Marcus Kruger on injured reserve with a concussion. Kruger suffered the injury last night when he was hit by Nashville Predators forward Ryan Hartman, and will be out indefinitely. 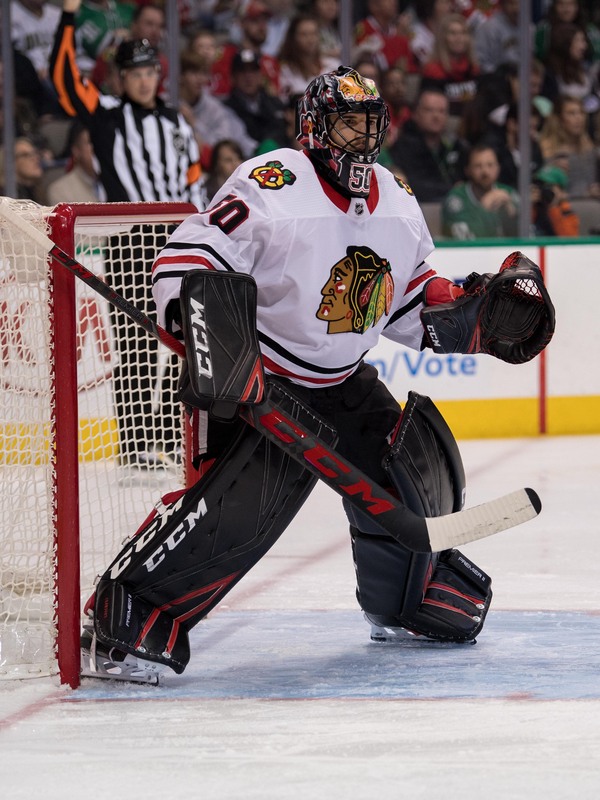 Johnson meanwhile returns to the Blackhawks after playing 13 games with the club earlier in the season. Phil Varone is on his way back to the minor leagues, loaned from the Philadelphia Flyers to the Lehigh Valley Phantoms today. Varone has played four games for Philadelphia this season but has been held scoreless in each. The veteran forward is a dominant AHL player though, and has 28 points in 22 games for the Phantoms after posting a 70-point season in 2017-18. The Arizona Coyotes have sent goaltender Adin Hill and forward Conor Garland back to the minor leagues, though with no corresponding moves yet one or two could be back up quickly. Since Hill and Garland were both originally recalled before December 11th, they would not be able to be sent down during the freeze. Now they will be able to freely move up and down throughout, allowing them to get into game action should Arizona activate some of their injured players. The same tact might be taking place in Los Angeles, where Michael Amadio, Sean Walker and Austin Wagner have all been sent down to the AHL. Again, all three players had been recalled prior to December 11th, meaning this move is likely only to create some roster flexibility through the roster freeze. In Vegas however, the Golden Knights have recalled Brandon Pirri and had him at practice today with the club. Pirri has been dominating the minor leagues once again, and with Max Pacioretty headed to the injured reserve, the team needed another forward. The 27-year old Pirri once scored 22 goals in just 49 games for the Florida Panthers, but has struggled to find consistent work in the NHL since. This year for the Chicago Wolves, he has 41 points in 28 games and has looked far too capable for the AHL. Thomas Hickey has been moved to injured reserve, giving the New York Islanders roster room to recall Devon Toews. The 24-year old Toews has yet to make his NHL debut but is a leader for the Bridgeport Sound Tigers all over the ice. The defenseman has 86 points through 130 minor league games since being a fourth-round pick in 2014, and could give the Islanders a decent puck-moving presence going forward. Another Los Angeles Kings player is on his way down, but this time it’s for a conditioning stint. Jack Campbell has been sent to the minor leagues to continue his rehab, an important step on his recovery process from a meniscus injury earlier this year. Campbell is still on injured reserve for the time being. Clark Bishop is on his way back to the NHL, as the Charlotte Checkers announced that the rookie forward has been recalled by the Carolina Hurricanes. Bishop, 22, was a fifth-round pick and was never much of an offensive force in his junior years. The two-way center even split his first pro season between the AHL and ECHL. 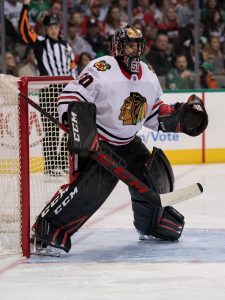 However, Bishop has worked hard and is now a regular call-up for Carolina in his third season. Bishop has two points in 15 games for the ’Canes this year. Entering the free agent market late is never an enviable position. Hitting the market in August coming off the worst season of your pro career? That’s a really tough spot and the one facing down veteran forward Troy Brouwer this summer. Brouwer became the latest addition to the unrestricted free agent market on August 3rd, after the Calgary Flames bought out the remaining two years of his contract in the second buyout window awarded in consideration of the team’s salary arbitration status. As if becoming a free agent more than one month after the signing period began wasn’t enough of a difficult situation, Brouwer also entered a quiet market that had seen just two impact UFA signings – Brooks Orpik and Dan Hamhuis – in the previous two weeks. Now two weeks later, there has still not been another major addition and that includes a lack of interest in Brouwer. Brouwer, who just turned 33, has begun to show his age. While physicality and two-way play have always been hallmarks of his game, Brouwer also did well for himself earlier in his career with seven straight seasons of 33 points or more while playing for three different clubs. He cashed in on that consistency two years ago, inking a four-year, $18MM contract with the Flames as a free agent – the most lucrative deal of his career. The situation in Calgary turned sour quickly, as Brouwer’s speed and production took a noticeable dip in his first campaign. The reliable forward only managed 25 points and, to add insult to injury, struggled on the defensive side of the game as well. Last season, Brouwer’s even strength ice time was cut to a career low and his production dropped again to a career-worst six goals and 22 points. At $4.5MM per year, Brouwer’s play last season showed the Flames that he was simply a burden they could no longer shoulder moving forward, even if his buyout meant adding a $1.5MM penalty for each of the next four years. Now, the question is whether he can bounce back from a disappointing tenure in Calgary? And will any team even give him that chance? If the offense is really gone from Brouwer’s game, then he is more of your typical fourth-line grinder at this point in his career. He still plays a very solid short-handed game, has always had a knack for stripping the puck, and can check and win battles along the boards with the best. Brouwer has even been known to excel at the occasional face-off in the past. In an energy role where he would be specifically tasked with bothering the opposition and focused more on preventing goals than scoring them, Brouwer could still thrive, maybe even for a few years. A versatile, two-way right winger could be in demand with several squads. Especially given the fact that Brouwer’s buyout payments should drive the price of his next contract down, he could be a good value pick up for whichever team lands him. The Colorado Avalanche may be the best fit for Brouwer. The Avs’ forward corps is very young and not very deep in two-way players. The roster is also completely devoid of natural right wingers. The veteran grinder could also serve as a good mentor to young Avalanche forward A.J. Greer. There is a clear fit for Brouwer on the Colorado roster more so than any other team in the league. The Buffalo Sabres also stick out as a prime candidate to give Brouwer a shot. The team’s off-season indicates that they are all-in and looking to do more than just rebuild this season. While the Sabres are actually deep up front, they lack many players that fit nicely into a fourth-line, penalty-killing role. They also don’t have many right-shot players who are true two-way assets. Brouwer could fill that niche role. However, Brouwer would have to win a job against one of Buffalo’s younger fringe forwards. Don’t rule out a return to the Chicago Blackhawks either. The team has shown a tendency to be interested in former players and with the likes of Matthew Highmore, John Hayden, and Jacob Nilsson currently penciled in to compete for jobs on the right side, there is a lot of reason to think that Brouwer could make a difference in Chicago. The team does have Marcus Kruger back and signed Chris Kunitz, but Brouwer on that line would make for an intriguing veteran shutdown unit. Despite some good hypothetical landing spots, the reality is that if there was demand for Brouwer, he would have signed by now. Some expected the veteran forward to be scooped up off the market as soon as he was bought out, but the interest just hasn’t developed. There is no reason to think that it suddenly will either; grit and character are not exactly traits that teams scramble to replace after injuries or realize they desperately need in training camp. Brouwer could still end up with any number of NHL teams and can still be an effective two-way forward for multiple years. However, in all likelihood he will have to earn that next contract on a PTO . He may even be looking at a mid-season contract situation for a contender to add a locker room presence and depth defensive forward with experience like a Brian Gionta or Ryan Carter in recent years. That is the ceiling for Brouwer after a ruinous time in Calgary. Among the ways teams can increase the value of potential trade candidates is by retaining a portion of their salary. These moves are often used on star players who may have declined slightly and are no longer deemed worthy of their big cap hits, or at the deadline in order to fit in as many contracts as possible for the playoff stretch. Any team can retain up to 50% of a player’s salary for the remainder of the contract, though a single player can only be involved in two of these transactions per contract. While these transactions are hardly crippling the above teams, they are something to remember when the trade deadline rolls around and clubs are trying to swap contracts. Teams like Toronto and Vancouver who have retained salary for another four years might not want to get into a similar situation and lock up two of their three possible options for the future. The other question surrounding retained salary transactions will be how they affect the upcoming CBA negotiations, after teams like Vegas have acted as a sort of middle man. Brassard was never really part of the Golden Knights, only coming there on his way from Ottawa to Pittsburgh in order to reduce his salary for the Penguins. Though Vegas received compensation, it is not how the rule was intended to be used. The St. Louis Blues had one of the best offseasons in the league when they managed to acquire Ryan O’Reilly, Tyler Bozak, David Perron with in the first few days of the start of free agency. The fact they were able to add those players without mortgaging their future prospects, make their offseason that much more successful. However, when the team signed winger Patrick Maroon to a one-year, $1.75MM deal, the team really looked at their offseason as a roaring success. Maroon, who opted to give up both money and term so he could sign with his home-town Blues, could easily have gotten both elsewhere. Maroon, who made $2MM last year, has scored 44 goals in the past two years, making the 6-foot-3 physical forward an excellent, inexpensive addition. However, the St. Louis Post-Dispatch’s Jeff Gordon writes don’t be surprised if Maroon gets an extension before the 2018-19 season ends. It’s likely the team will give him that deserved money and term when the team’s salary cap situation improves next season. A lot of that will depend on how Maroon plays next season. The 30-year-old will likely find himself on the team’s third line, which could prove challenging to put up big numbers in. However, with his experience and ability to play along with top-line talent like he did alongside Connor McDavid in Edmonton, Maroon could easily find himself in a top-six role if injuries develop or lines don’t produce like the team hopes. In a mailbag segment, the Tennessean’s Adam Vingan writes that he wonders whether the Nashville Predators insistence on not including no-movement clauses is what’s hurting the team from signing top free agents to their team. In fact, the scribe wonders whether the team can keep that policy up when it comes to re-signing defenseman Ryan Ellis. The problem with refusing to include no-movement clauses into contracts is that players will often take less money to stay with the Predators due to the lack of a state tax in Tennessee. However, the issue that many players have is that if the team trades them and the player then doesn’t receive the tax benefits. Only goaltender Pekka Rinne has a no-movement clause. Mark Lazerus of The Chicago Sun-Times writes that despite the team lack of success when bringing back former Stanley Cup Champions to their lineup, the acquisition of Marcus Kruger is a minimal risk. The veteran forward, who was acquired in the Marian Hossa deal with the Arizona Coyotes, is in the last year of a three-year, $9.25MM deal in which he will only cost them $2.775MM against the cap. The forward struggled in Carolina last year, posting just six points in 48 games and played some time in the AHL as well. However, it turns out he played most of the season with a sports hernia injury. At just 28 years of age, the team should be thrilled if they can get some quality minutes out of him on the team’s fourth line. With a strong second half, the Arizona Coyotes are ready to take that next step from cellar dweller to competitive team. The hope is that now that head coach Rick Tocchet has held the coaching reigns for a full season, he can help Arizona take that next step. While the importance of signing of star defenseman Oliver Ekman-Larsson is critical to the long-term success of the team is key (he has been rumored to be considering and eight-year extension), the team must continue to upgrade its roster. According to Tocchet, in an interview with Arizona Sports’ Craig Morgan, the team has several key needs with center being at the top of the list, followed by another top-five defenseman and a scoring wing. The team upgraded at center a year ago when it went out and traded defenseman Anthony DeAngelo and their first-round pick in a package deal for Derek Stepan and Antti Raanta. Stepan put up solid numbers as the team’s top center, scoring 14 goals and adding 42 assists in his first year for Arizona. However, the team might want a stronger, more veteran presence for the No. 2 center spot, which was held by Christian Dvorak last season. Dvorak had just 22 assists last season. Despite a solid nucleus on defense starting with Ekman-Larsson and Alex Goligoski as well as the strong additions of veterans Jason Demers and Niklas Hjalmarsson in the offseason and the improved play of youngster Jakob Chychrun, the team would like to add more to their defense. While the team might address that with the fifth-overall pick this year, the team wouldn’t mind adding another player to their group, which might have to come via trade. In the same article, Tocchet said that the addition of veteran Marcus Kruger is important due to his leadership skills. While the veteran struggled in his one year in Carolina with just six points in 48 games, Kruger did admit he played the entire year with a hernia. However, fully healed, he should give the Coyotes some grit on their fourth line. “The Chicago coaching staff loved him. I hear his hockey IQ is high and he’s a leader in the sense that he does the right things, practices hard. Since I’ve started, hockey IQ to me is bigger than I ever thought it was. When you add players with high hockey IQ, the chemistry comes quicker. He can probably help some young guys with that,” Tocchet said.